In a quixotic act of counter programming, Canadian comics publisher Drawn & Quarterly released Seth's defiantly low-key "Clyde Fans Book One," ($19.95; 156 pp.) Wednesday against the roaring hype of Sony Pictures' movie adaptation "Spider-Man 2." It was a marketing non-starter of epic proportions with "Spider-Man 2" setting an opening day record of over $40M, according to hollywoodreporter.com. Opening day sales figures for "Clyde Fans" were unavailable at press time, but it's safe to say it made less than $1M. Of course if success is measured in terms of humbleness, dignity and art, "Clyde Fans" trounces the competition. While comics have a reputation for being high-impact, garish entertainments epitomized by such superhero antics as Marvel's Spider-Man, they have just as much ability to be quiet and contemplative. It is this aspect that the singularly named Seth, nee Gregory Gallant, 41, has come to make his metier. "I think what most interested us when we were in our twenties and talking about cartooning a lot was not so much the content of the stories but breaking away from the traditional approach to how cartoon stories are told," Seth told TIME.comix. 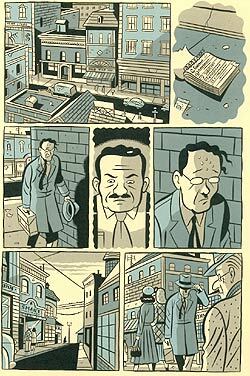 "Certainly for the history of comics, it's been a medium of expediency. In the old days a cartoonist would have to tell a whole story in eight pages." 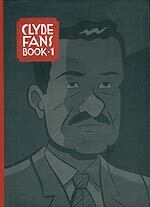 "Clyde Fans" tells the wistful history of two brothers and their family electrical fan business. The inspiration came from an actual "Clyde Fans" office in Toronto. "It was a very old storefront," Seth said. "I used to look into window when I walked by because I'm very attracted to this sort of thing. In the dim light of the office you could see on the back wall two photographs of two men, which were probably the owners. I just assumed they were brothers. Over the next couple of years while working on projects I put together a story of what these guy's lives were about although it probably had nothing to do with the reality of their real lives." The first half of the book follows older brother Abraham, long retired, as he passes a lonely day. We see him take a bath, fix himself some tea and putter around the closed office. During all this he does something almost unseen in comix. He delivers a monologue. Nearly 70 pages long, during this strangely theatrical sequence he tells us about his sales technique, the history of the family business and his peculiar brother Simon. Essentially you are watching an old man ramble on. Whether you find this prospect alarming or enticing essentially defines your interest in this book and in Seth's work in general. SILENT RUNNING: Simon wanders the streets, haunted by his brother Abraham in "Clyde Fans"
The second half of the book  there will be five episodes across the two volumes  follows Simon, 40 years earlier, on a humiliatingly unsuccessful attempt at opening new sales territory. Clearly far too introverted and insecure for such a task, he gets turned away from shop after shop while his brother's patronizing, scowling face seems to follow him everywhere. Eventually he has a bit of a breakdown, wandering aimlessly through a fantastical miniature golf course until quietly sitting under a tree. Using remarkable understatement the Simon sequence gets at the drama that governs our actual lives: succeeding or failing at ordinary but important events. Drawing in smooth, almost aerodynamic lines, Seth evokes the style of the 1930's "New Yorker" cartoonists. Combined with its palette of black, gray and pale blue, the very look of "Clyde Fans" exudes a melancholy nostalgia. A major part of Seth's attempt at moving away from traditional comicbook storytelling includes, as he says, "giving a story as much length and breathing space as it needs to be told, which usually means slowing down the narrative, [including] a lot of silent space  panels that aren't necessary to move the story along but are necessary just to create the right mood for what you're doing." Papers fly down empty streets. A typewriter sits on a desk. People go by; things go by. Seth creates the elegiac atmosphere of an apocryphal, slow-paced past. He does it like no other comix artist, and the effect feels akin to taking a warm bath. Anyone turned off by the screaming, exploding in-your-face graphics of mainstream comicbook fare should seek the solace of Seth's "Clyde Fans Book One." Pull your rocker onto the back porch, or spread your blanket on the roof, turn on the fan and enjoy the quiet.